Or, maybe they're loggerhead turtles. There's some dissension in the comments. The video was taken at Palm Beach Shores in Florida. I didn't know they were making the book into a movie. More at /Film. A giant Pacific octopus living in a Cornish aquarium has formed an unlikely bond with a child's plastic toy. Louis regularly plays with the Mr Potato Head figure which was given to him as part of an enrichment project at Newquay's Blue Reef Aquarium. "We wanted an octopus-friendly toy which had a compartment to hide food in," said the aquarium's Matt Slater. He says Louis gets very excited when sees the toy, which he plays with for an hour at a time. "Its bright colours, strange shape and moveable parts make it fascinating for Louis," said Mr Slater. "The secret space within Mr Potato Head allows us to hide tasty treats like fresh crab inside and that perhaps more than anything has resulted in him becoming such a hit." In the past, keepers have used everything from perspex boxes to rubber toys and even fishing floats to keep Louis, who came from Vancouver about nine months ago, mentally active. 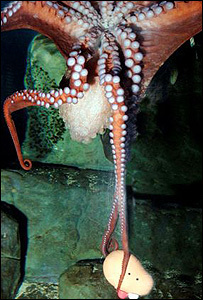 The giant Pacific octopus is the world's largest species of octopus and are found from Japan to Southern California. The biggest recorded specimen had a span of 10m (33ft) and weighed 270kgs (600lbs). Louis, who is 18 months old, stretches about 1.5m from tip to tip. "Louis is well known for his curiosity and intelligence," said Mr Slater. "We've devised a series of puzzles, games and toys to ensure he's getting the mental stimulation he needs, but Mr Potato Head is definitely his favourite at the moment." ...Queen of the Deep! - here at Deep Sea News. ...it is oegopsid squid and thus decapodiforme.